RMS 714 is a Leyland Tiger Cub PSUC1/2 with Alexander body and was new to W Alexander & Sons (Fife) Ltd in 1961 arriving just as the Alexander empire was split into three separate companies. It was delivered in Alexander’s blue and cream livery but later received the new Fife livery of Ayres Red and cream. It worked initially from Dunfermline depot, moving to Newburgh in 1964. It was withdrawn and sold in 1977, becoming a stock car transporter. By the time it was purchased for preservation around 1998 it had been re-registered JVS 541. 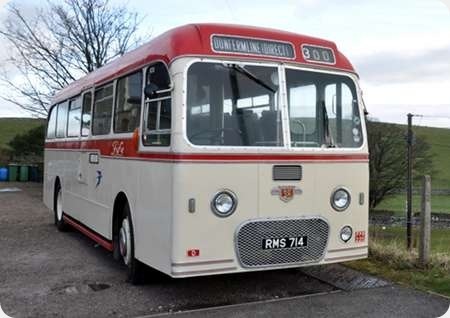 It was restored at the Scottish Vintage Bus Museum in Fife and was again re-registered OSC 711. By 2008 the then owner had managed to re-acquire the original registration RMS 714. It passed to an operator in Somerset in 2011, but was returned to Scotland by its present owner in 2013. Nice view, Ken. I’ll cross this vehicle off my list of possible future submissions. Just a small point, but isn’t the fleet number prefixed F for Fife? I found the fleet number on BLotW checked with BBF Scottish Bus Group and you are correct it should be FPD thanks for that Pete. Some of these examples were used at Ardyne Point by G Wimpey to transfer workforce from Dunoon to the rig construction site. Although Alexanders purchased significant numbers of Regals and Reliances, they only purchased one batch of 20 double deck buses from AEC, all of which joined the Midland fleet when the company split into three. 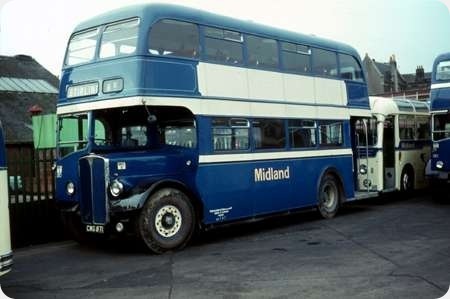 As with virtually all the double deckers bought new by Alexanders post war, it has an own-build lowbridge body, and this batch was among the first to carry the new style with a rounded dome compared with the slightly angular earlier style based on the Leyland design. MRC8 is seen here parked up at Stirling Bus Station on 4 November 1969, and carries a Bannockburn depot plate. It also displays the then relatively new style of ‘Midland’ fleetname, replacing the traditional Alexander style. The traditional Alexander smartness belies 18 years of service; by this stage many of its fellows had already been withdrawn. The ‘Midland’ (BMMO-style) fleetname is actually the third version to be used after the Alexander company split. The first was an underlined scroll similar to that used originally by Fife and Northern. They then reverted to the traditional Alexander style, but emphasising MidlanD as the middle line rather than AlexandeR. These 20 chassis were diverted from a Scottish Omnibuses order – recompense for the rubbish transferred from SO with the Dundee area perhaps?